Why change a review form? Most basic set-ups will contain one round of review with one review form. That being said, you may have unique needs and may have different reviewer types, different rounds, etc. The following setup would be used only when the rounds are completely separate and do not overlap. Only used in situations when the rounds are completely separate and do not overlap. Round 1 Scores and Comments will not be deleted, but cannot be seen while the Round 2 form is active. Scores and comments from both forms are viewable in reports. 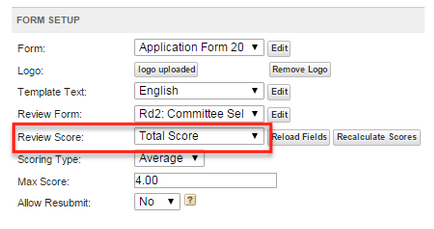 Change the Max Score to the maximum calculated score on the review form. Click SAVE. 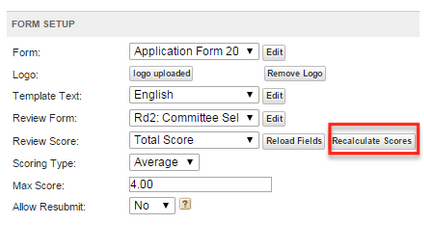 Upon reopening Form Settings, click "Recalculate Scores." Then click Save again. This will establish the new connection and review form. The steps above do not address assignments. 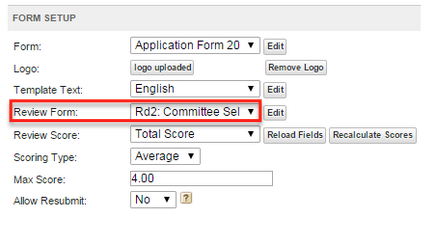 If new assignments are needed, meaning different reviewers will review different applicants in Round 2, then proceed to the Assignments tab. Click “Delete Assignments." This will clear out the previous Assignments. It will not clear out the previous reviews. Applicant has a 1st Round score.